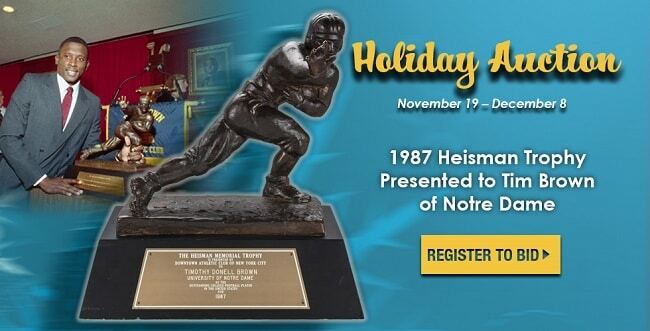 The nostalgic Heisman Trophy won by Tim Brown in 1987, star wide receiver out of Notre Dame, will be auctioned online by Goldin Auctions and can be yours if the price is right. Will any reader or follower of THE Sports Techie community blog step up and purchase this treasured heirloom? You can participate from anywhere in the world simply by registering at https://goldinauctions.com/. The fun begins on November 19. Bidding ends December 8 when this rare collector’s item is to be awarded shortly after the 2018 Heisman Trophy winner is announced in New York City. Imagine that, this priceless item displayed inside your glass case for the rest of eternity, or should you auction at some time in the future for five times what you paid for it. No Heisman after 1998 can be sold. 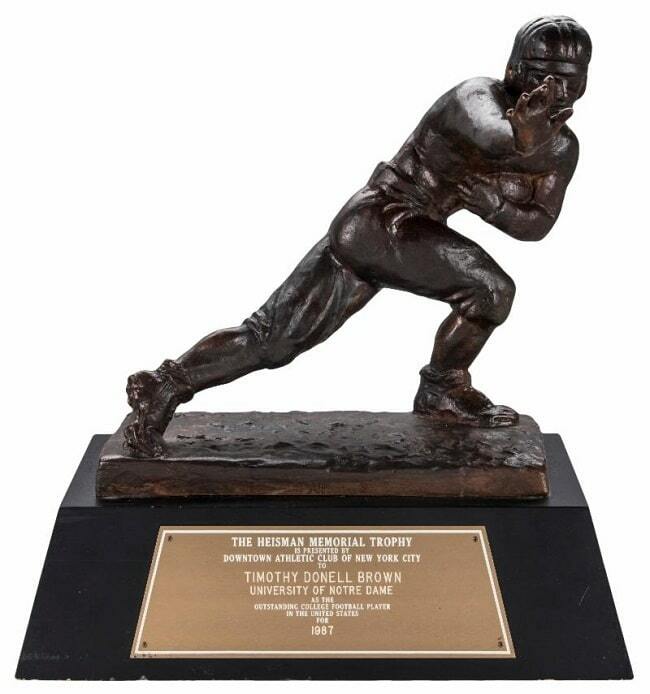 Heisman Trophy Awarded To Notre Dame WR Tim Brown Available Via Goldin Auctions – SportsTechie blog. I will not be bidding as this promises to be out of my blogger and Lyft driver budget. However, you or someone you know should you share this news out of New Jersey, can be the owner of this authentic memorabilia, the first ever to be granted to a wide receiver. Brown is one of nine Heisman winners in the Pro Football Hall of Fame. This marks the second Heisman ever auctioned off after the one earned by USC’s O.J. Simpson was sold to a wise and lucky auction participant. To give an idea of what a real bid might cost, the Rashaan Salaam trophy (RIP) sold for just under $400,000 setting a record. The 1941 Bruce P. Smith trophy was the previous high mark selling for $395, 240. No question a half million dollars and probably more is what someone will have to pay to win this one. Say you low ball the bid. Do not fret as there are nearly 1,000 items available to bid on ranging from collector cards, to worn jerseys and Championship rings, to cars, autographed sports balls and documents of all nature. Bidding ends December 8 when this rare collector’s item is to be awarded shortly after the 2018 Heisman Trophy winner is announced in New York City. Not only is Brown a Fighting Irish legend, he was also a Hall of Fame player for the Oakland and Los Angeles Raiders. He was also a fantasy football monster performer. Wouldn’t that be something if a Las Vegas casino outbid everyone in anticipation of the Silver & Black moving to Sin City in a couple years allowing NCAA college football and NFL fans alike the opportunity to engage with the rare item whenever they visit town. For that matter, maybe the bidding war happens between Vegas and N.J. casinos where betting on sports is now legal. Perhaps a risk taking gambler will lay down the largest amount or a former professional football player with the kind of disposable income needed to win this special offering will take home this one-of-a-kind treasure. There are plenty of wealthy millionaires and billionaires that made their killing in technology that certainly could enter into the fray. Or, a possible unknown bidder may emerge say from the Middle East, China or Russia. Anyone that enters the final successful bid online by the end of the auction wins this prize. Simple as that. Sports memorabilia pioneer Ken Goldin has delivered more than $700 million in unique memorabilia pieces associated with iconic sports, history and pop culture names. He is credited with pioneering the use of television to peddle valuable sports memorabilia. Now the Internet is their preferred medium. Goldin Auctions was central to the sale of the Babe Ruth 1918 contract for a record amount of $1.02 million, in addition to hawking an extremely rare Honus Wagner T206 card auctioned for a public sale record of $3.12 million. The original Mike Piazza post-911 home run jersey sold for $365,000 after the uplifting World Series ended. Goldin was also responsible for the sale of the 1979-80 Wayne Gretzky PSA 10 rookie card for another record amount of $465,000. Goldin Auctions has the vision to use various technologies as a bidding mechanism allowing collectors across the nation and world a fair and impartial tech-driven opportunity to buy the best collectibles via a web-based auction as dictated by the marketplace. Every game-worn and autographed item is complete with team, player, league or additional LOA from industry leading authenticators; enabling savvy collectors to have trust that their proxy/ceiling bids all remain extremely confidential. Sports Techie, Ironically enough, I recently connected with Tim on LinkedIn. I thought about reaching out to him to ask how the trophy went from him to Goldin Auctions but changed my mind after thinking it through and respecting his privacy. Tim, if you want to follow up with me about this story, please do, I’d love to chat about it. No worries though. The Heisman Trophy race this year is still up for grabs as is Tim Browns’. ESPN has a tracker you can follow. Tua Tagovailoa, Kyler Murray and Will Grier all quartebacks, are the leading candidates thus far but the season is not over. Sports tech is a driver of so many amazing things, including Goldin Auctions 2018 Holiday Auction. Is there a prop bet or odds as to what the final bid will be? We may be talking $1 million up to $5 million making history. Bid on fellow football fans.